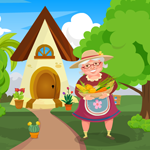 Games4King - G4K Grandmother Rescue is another point and click escape game developed by Games 4 King. There were some houses in a beautiful and magnificent city. The city was very beautiful to see. A grandmother lives in that city. That grandmother was unexpectedly stuck in a house in a day. Your duty is to save the grandmother from there. It will help you to find the hidden clues where the grandmother is saved from there. All the clues are detected and the grandmother rescued from there and congratulations you win the game. The tricks of the trick are a little harder to find, but somehow it may be a matter of interest. This game is highly desirable. Good luck and have a fun! found a shovel and used it in scene 2.
found a star but don't know where it goes. found 3 cookie jars - need 3 more. NEED color code for spinner puzzle, both left/right clues, and the clue for the grey pot puzzle in the far right scene. flowers in far right scene are clue for green arrow sign in far left scene which gave magnet to get key from fountain. Now I am able to move forward. pitcher and pitchfork used in scene 2.